The location of the proposed Amaila Falls Hydro-power station. Norwegian experts have confirmed that the proposed 165 megawatt Amaila Falls Hydropower station is the best option for Guyana to wean itself off of fossil fuel generation and has recommended that government quickly makes a decision and, together with the opposition, reach consensus before renewing a search for international investors. “In order to establish broad interest among well experienced and reputed international sponsors, it is most important that the political parties succeed in reaching a lasting agreement on the way forward. This would reduce potential investors’ perception of political risk by the project and thereby make engagement in the project more attractive and reduce the mark up on the tariffs for covering such risk,” Norconsult said in its 49-page report released by the Ministry of the Presidency on Wednesday. Assuming that Guyana reaches national consensus and all arrangements are concluded in a timely basis, the experts say project preparation for AFHP until Financial Close and Notice to Commence to the Engineering Procurement and Construction (EPC) contractor will take three years. From this point in time, we estimate another 3.5 years for construction until start commercial operation of Amaila Falls Hydropower Project. While the People’s Progressive Party Civic (PPPC) had been in office, the then opposition A Partnership for National Unity (APNU) had refused to give parliamentary support to allow for unanimous House approval for a proposal by Sithe Global for certain project features, including raising the ceiling for maximum annual payment by Guyana Power and Light (GPL) as the sole power purchaser. Voted into office at the May 2015 general elections, APNU+ Alliance For Change (APNU+AFC) maintained that the Amaila deal was not in the best interest of Guyana and eventually, agreed with Norwegian International Climate and Forest Initiative and the Norwegian Agency for Development Co-operation (NORAD) to have Norconsult conduct an objective and fact-based assessment. In the report dated December 12, 2016, the consultancy company that reviewed the feasibility of the US$858.1 million project, however, found several technical drawbacks in the original plans including insufficient data to determine potential impact of the dry season, the absence of a bottom outlet and a flawed financial model. Based on its revisions, NorConsult estimates that it can cost US$57 million less, by removing the US$20 million that have been spent on constructing the Amaila Falls Road and adjustments to contingency, financing fees and Sinosure insurance. Against the background of perceived high investment risks in Guyana mainly due to political and regulatory reasons, NorConsult said one possible way for Norway to support the project would be to issue guarantees to the project for the repayment of the loan. “This would reduce the financing costs substantially, and the risks for the equity sponsor of the project. We recommend that possible guarantee support mechanisms are evaluated as part of the further work on the project,” the consultancy company said. NorConsult concluded that Amaila Falls Hydro Power is the fastest way and first major step forward towards an emission-free electricity sector in which current oil-fired generation would be substituted. In reviewing the proposed tariff structure, Norconsult said that With the modified financing and removal of the access road construction cost, the average generation tariff has decreased from the original 9.04 USc/kWh to 7.98 USc/kWh. The initial tariff has decreased from 11.2 USc/kWh to 8.85 USc/kWh, although the number of years with the higher tariff has increased from 12 to 15. After the 20 years’ Power Purchase Agreement period, the project is returned to GOG, and the energy cost will then be 1.43 USc/kWh, which only covers operating costs and maintenance. With this suggested financing scheme, the annual payments from GPL under the Power Purchase Agreement will be below USD 93 million in the initial years, but increasing somewhat due to inflationary adjustments of operating costs until year 15 when tranche A has been fully repaid. Under the original financing scheme, the corresponding annual PPA payments were USD 117 million, which means that the suggested changes to the financing has reduced the annual PPA payments by about 20% in the initial years. The consultants said that by restructuring the financial model, the risk for Guyana’s economy can be reduced. The annual payments from GPL may possibly be reduced by 20%, which are significantly lower than the current fuel costs paid by GPL for its oil fuelled generation. “The risk to Guyana’s economic stability would be at the same level with other projects generating the same amount of energy, as the investment would be of a similar magnitude,” they said. In preparation for possible construction of the Hydropower plant, Norconsult said the Engineering Procurement and Construction (EPC) tenders from 2008 are outdated and would have to be replaced by a new tender process after certain technical features of the project are reviewed and new EPC tender documents are issued. 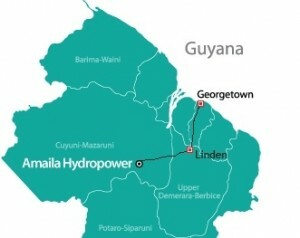 The report states that the Inter-American Development Bank (IDB) or a similar institution would have to continue supporting the Guyana government, a d the Guyana Power and Light would need technical and management support by a highly qualified engineering company with extensive experience from the international hydropower industry. If later agreed between the parties, Norcosult said, the same engineering company may continue in a role as independent engineer in the relation between GOG/GLP and the new main sponsor. Norconsult found that the decision by the PPPC administration to build the Amaila Falls Hydropower station did not take into account latest data on the inflow estimate of the reservoir in the dry months. The consultancy firm states that Guyana’s objective of reaching 100 percent emission-free/renewable energy use by 2025 may not be achieved unless the required back-up thermal plant capacity is, if technically and logistically feasible, switched from oil to biomass fuel. If a combination of biomass, solar and wind do not satisfy demand, Norconsult said there would have to be power outages or alternatively the construction of a second hydro power station with a seasonal reservoir large enough for maintaining most of the production capacity during dry periods. We are not aware whether a site may exist with a potential for a large, environmentally acceptable, seasonal reservoir. Development of smaller run-of-river hydro may reduce the dependence on thermal generation as the demand grows beyond AFHP’s capacity, but will not be a solution to achieve the “some 100% emission-free goal” as run-of-river projects will not contribute much in the dry season and not reduce the need for back up capacity in the dry months, the report states. It added that reliable supply combined with lower tariffs will certainly attract industrial investment and thereby accelerate growth in consumption. To maintain 100% renewable energy use, new emission free, or emission neutral, generation capacity will have to match the growth in demand. Supported by IDB, SG started a program for continuous simultaneous measurements in 2011 at Amaila Falls and Kaieteur Falls. That consulting firm notes that this program was discontinued in 2013 after SG withdrew as sponsor. A planned review of the hydrology based on the additional data acquired so far, is suspended. Norconsult suggests that there continuous water flow measurement resume as soon as possible and before a new main sponsor would be ready to take the front seat. T”wo to three additional years of continuous flow data would provide a more reliable basis for an updated energy production simulation and thereby reduce the risks for both parties related to the PPA (Power Purchase Agreement). The experts said based on the same improved flow data the design flood capacities of the dam spillway and flood levels of the reservoir should be reviewed as well. In addition to flow records we recommend a continuous sediment sampling program of at least one year’s duration to get a picture of the seasonal variation. Other aspects flagged by Norconsult for attention include whether to erect a stronger transmission line based on long-term plans for Guyana’s power system which may include more suppliers. “Considering need for transmission from other hydropower development in the same region in the future, as well as a possible extension of Amaila Falls, it should be considered whether the capacity of the line should be upgraded and the line itself be regarded as a backbone in a future transmission system intended for several projects rather than only as a component of AFHP.